Info "Hold the Form Baton in your hand and slap it gently to the rhythm. See? Doesn't it sound nice?" 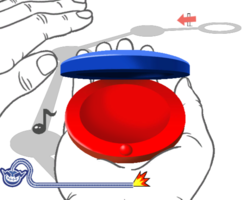 Castanet, First Chair is one of Young Cricket’s Microgames in WarioWare: Smooth Moves. Players can watch the rhythm of the bouncing notes. Then they should hold the Wii Remote in one hand and tap the top of it with the other hand to the beat when the notes bounce over the trap. The notes turn into frogs as they pass over the trap. If the remote is not tapped, the frog(s) may be eaten by a snake. 1st level difficulty: One note. 2nd level difficulty: Two notes. 3rd level difficulty: Three notes. The song played in the second level is the theme for Mona Pizza.